KDE needs as an entire project to support a Web browser that everyone can use in 2009. 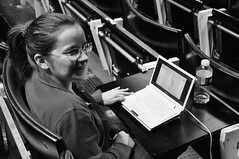 That's the simple message behind this blog entry and my talk at LinuxTag on Saturday. If you need any more motivation to go out there and make that happen, read on. On Sunday the work continued at a furious pace. Dario carried on moving the connection list generating code out of the applet and into the KDED module. This makes the applet much simpler and easier for Plasma specialists to improve. We considered using a Plasma DataEngine or Service, but decided not to for now because it adds another layer of indirection. For NetworkManager at least, if the settings service process leaves the system bus (due to a deliberate or accidental exit) you fall offline. I felt like the grumpy grandpa of the NM sprint when the others hammered on my door at 9.30am after I'd rolled over for just another 10 minutes two hours earlier. The grey cells do still work once you hit your thirties but they need more care and feeding if I want to be able to speak intelligibly the next morning - not going to rock bars until 3am! I pried my eyes open at 0430 and stumbled to the airport. This all started about a month ago when we had the idea of having a developer sprint to get Network Management into shape in time for KDE 4.3's release. Now I'm sitting in a meeting room in Oslo listening to the progress report of 3 Norwegian students Peder, Sveinung and Anders who are investigating ways to make setting up mobile broadband connections easier. Thanks to the KDE eV's sponsorship, six of us are meeting this weekend. A promising student was talking with me about working on Network Management in GSoC 2009, but decided to concentrate on his studies this summer. Out of the discussion I've created this idea proposal. In case anyone is interested in making mobile broadband connections really easy to do in Network Management, see the KDE Google Summer of Code 2009 ideas page. A helpful chap just popped into #opensuse-kde and asked about our c# bindings. It turns out that our packages exclude them in the most violent way possible. 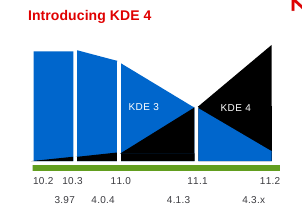 This made me curious as to why, as AFAIK they are a high quality binding that exposes the Joy Of KDE to an untapped pool of developer talent. The reason is lack of obvious demand and anyone to test them. So I'd like to know, if we enable building the (stable) Qyoto bindings for C#, would you use them? I'm drinking my Saturday morning tea and looking back on a pretty crappy week. I was burning the candle at both ends to get various enterprise stuff finished in time, and didn't have enough energy to really enjoy FOSDEM. 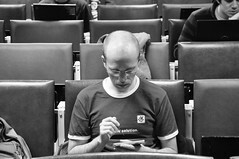 Here are the openSUSE devroom slides from FOSDEM 2009. I'm nearly ready to move NetworkManager-kde4 to kdereview now, after a crazy week of rehashing the connection layer (the bit that writes your configured connections to KConfig (and optionally KWallet) into something that I actually want to support for a few years.